Conwy Seed Fair, Tuesday 26th March 2019, 9am to 4pm. Conwy Honey Fair, Friday 13th September 2019, 9am to 4pm, the 30th Honey Fair organized by Conwy Beekeepers. Venue: Conwy High Street and Lancaster Square LL32 8DB, 9am to 4pm. Free entry. We expect the High Street and Lancaster Square to be filled with stalls, including honey stalls at the Honey Fair and plants and seeds at the Seed Fair; plus crafts and home produce and Conwy Farmers’ Market stalls. The High Street will be closed to non-emergency traffic from 9am to 4pm. Disabled access. Conwy High Street is paved with flagstones, and is accessible with care. The Fairs are very busy. Be wary in case of pickpockets. If you have any old photos of the Honey Fair we would love to see them. The Honey Fair is Conwy’s oldest event and probably its most sociable. 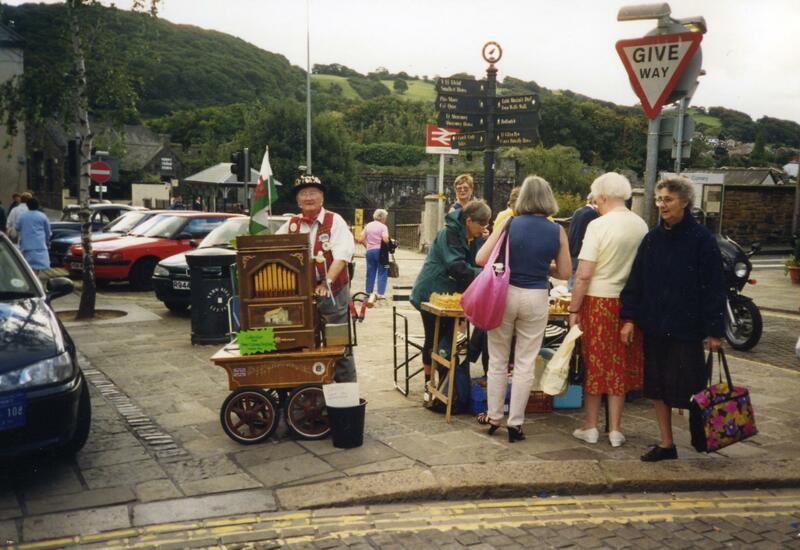 A “bee-rilliant event” according to stallholders The Snowdonia Society. The 2019 Honey Fair is on a Friday. Why not make a long weekend of it? See our list of Places to stay. Car. Conwy is on the A55, 1½ miles from Junction 19. There is very limited public car parking in Conwy town. Mount Pleasant long-stay Car Park just outside the walls, off the Bangor Road, is cheaper than the town centre Vicarage Gardens car park. Many visitors park free in Llandudno Junction, and walk across the Cob to Conwy, a 20-minute walk. Bus. Arriva buses from Bangor, Llandudno and Llandudno Junction serve Conwy regularly. Bicycle. 5-minute ride across the Cob from Llandudno Junction. Cycle tracks from Deganwy / Llandudno West Shore and Penmaenmawr. Train. Conwy station is five minutes by train from Llandudno Junction station. Llandudno Junction has services to Bangor, Chester, Crewe and London. Conwy Castle Edward 1st finest castle. Conwy Castle and the Town Walls are a World Heritage Site. Plas Mawr the best-preserved Elizabethan town house in Britain, reopens 1st April. Conwy Town Walls The best preserved town walls in Europe, free entry. Royal Cambrian Academy Art Gallery Crown Lane. Free entry. The Smallest House in Great Britain on the Quay. Aberconwy House free entry to National Trust members. Telford Suspension Bridge and toll-keeper’s cottage and garden. Free entry to National Trust members. The award-winning Albion Alehouse Highly recommended. North Wales Police Station in Lancaster Square. Unmanned, telephone contact only. Conwy Castle Visitor Centre and Conwy Quay, and at the Tourist Information Centre (20p charge) in the red-roofed building opposite the town centre Vicarage Gardens car park. Secretary, Conwy Beekeepers Ltd, a Company Limited by Guarantee. Organizers of the Conwy Fairs on behalf of Conwy Town Council. How are you? Have you got rid of those sticks? I just want to register for stall space (Garden Share Conwy) at the Conwy Seed Fair on Monday 26th March 2012. I do hope this will be OK , I had an excellent day last year. Let me know! I am disabled bees farmer based in Ghana. And a founder of Progressive Beekeepers Association, Berekum in Brong Ahafo Regional. I just want to register for Conwy Honey Fair which is coming on Thursday 13th September 2012. Please, I will be happy if you can seed me and my guide or helper invitation letter to help me access for Visa to join in coming program. Thank you may God Bless you. Sorry, we cannot offer assistance with visas. We support beekeepers abroad via the charity Bees for Development. We Pakistani base manufacturer for full range of bee keeping clothing and bee keeping leather gloves so I want to visit coming fair in Sep-12 and I want to know the procedure of visit. I am already in UK an trying to find some good source to sale our products so can you please let me know this fair is the best point to meet customers for such products.